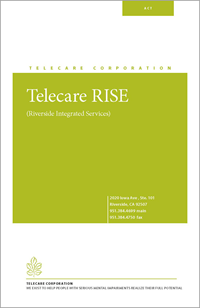 Telecare's RISE is an Assertive Community Treatment (ACT) program for individuals with serious mental illness. These programs exist to help people live successfully in the community and make strides toward their hopes and dreams and achieve their personal recovery goals, while avoiding unnecessary psychiatric hospitalization. Treatment and support services are individualized and guided by the individual's hopes, dreams and goals. Most services are provided in the community, where members live, work and socialize. Population Served: Residents ages 18-59 or older, in the metropolitan Riverside, Mid-County and Desert regions. Individuals who may be transitioning from institutional settings like state hospitals, IMDs, jails or locked psychiatric facilities. These individuals may also have a history of incarceration or arrests, a co-occurring substance abuse issue, or a history of being homeless. Coordinated by the Riverside County Department of Mental Health. Family members can contact individuals at RISE by calling the main number at 951-384-4699.